We love creative materials & stationary. Here are our current favourite creative materials. We have tried and tested most of these and love them. We have also included a few that are on our list to buy. We have tried to include a wide range, so there is something for everyone. Good quality art materials make children want to experiment with making marks and creating. Sparkle Gel Crayons— We love any type of paint sticks, these are the ones we always have. The sparkle ones are a little bit special and they would make a great gift. You can use paintsticks on glass and they go one like paint. You can add water and they turn into watercolours. We love them, and include them in lots of our Make + Wonder Creative Boxes. Cotton Dust Sheet - Not really an art material, but really handy for keeping the mess contained. You can wash it, use it on the table or on the floor. Pentel Water Brush Pens — Perfect in combination with the gel crayons or paint sticks. (Also great to bring traveling in combination with some paint sticks or watercolour pencils). Liquid Watercolours - We mix these with water for a watercolour wash, or mix with poster paint for stronger colours. The colours are really cool. Honey Sticks - made from honey, perfect for little ones. They go on super soft and have no nasties in. Lyra pencils - Great for little hands to hold, as they are triangular. I always buy them for school as they are super strong and durable. Drawing pencils - A Good set of drawing pencils is a must in our house, this is our current favourite. We love to try new creative materials. 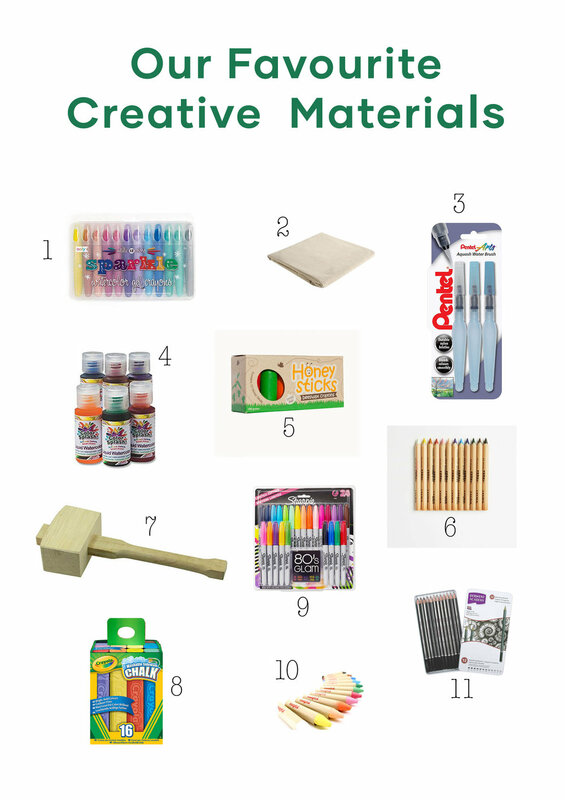 What creative materials do your children love to use?